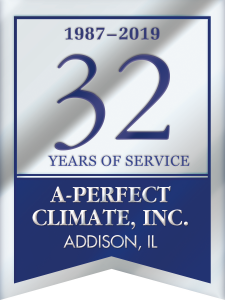 Since 1987, A-Perfect Climate has been leading the way in providing service, maintenance and custom installations of quality, major brand equipment for heating, air conditioning, ventilation, custom sheet metal work and indoor air quality solutions to the residential and light commercial market. Owners Richard Vollman and Michael Sitarski have been exclusively in the HVAC business since 1974 and 1979 respectively, and, to this very day, are accessible and actively involved in all aspects of operations. The service department trucks are complete with modern dispatching and communication, tracked by GPS monitoring. These vehicles are constantly updated with stock and parts with the goal being to save customers time and money by completing the repair in one trip. The installations department has the ability to fabricate custom sheet metal fittings on site, ensuring a neat, efficient, and leak proof installation. Each installation truck is literally, a sheet metal shop on wheels, complete with metal forming equipment and a layout bench, as well as fully stocked with hardware and ancillary materials needed to perform the installation of the highly technical equipment which is available in today’s market. Since incorporating with the state of Illinois, in April of 1987, A-Perfect Climate has been proud to be an independent Lennox dealer. Our valuable relationship with Lennox Industries has brought a quality line of products, as well as invaluable training. To provide an edge in service, we are constantly training to maintain certification for the employees in state of the art technology. A-Perfect Climate employs a licensed electrician, as well as NATE recognized staff. (NATE, North American Technician Excellence, is a well-respected testing organization, which only qualifies and recognizes the top field technicians in the industry.) You can rest assured that all employees work exclusively for A-Perfect Climate; we never sub-contract entire jobs. High Pressure air handlers and air distribution systems, including Space Pak and Unico systems. Call 630-691-8380 for more information.